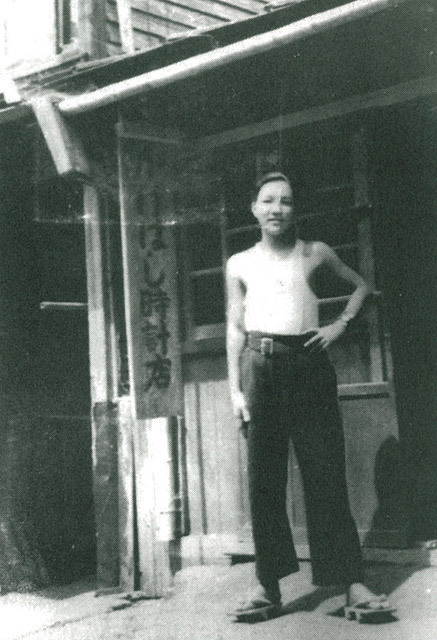 Ikutaro Kakehashi in front of Kakehashi Watch Shop. This post is part of a larger discussion on the way Electronic Dance Music has evolved alongside cultural and technological history. As part of this series, we’re highlighting elsewhere one of its main influencers: The Berlin School of Electronic Music. There you’ll be able to see the role a certain drum machine, revealed here, would play in shaping EDM. This drum machine had no preset rhythms or patterns, it was a true drum machine in this aspect: when you pressed a button you heard a corresponding drum sound. It was a drum pad…before the idea existed! Such a revelation was met with deafening rejection for the next three years. The Rhythm Ace FR-1, released in 1967, added a concession for the market (preset patterns) that allowed it to become the standard add-on for nearly anyone who bought a Hammond organ those days. Compared to the enormous Wurlitzer, Kakehashi’s Rhythm Ace, made more compact in size by its use of transistor parts, negated any more exploration of the electronic drumming part. If, the drum machine playback was handling the duties so well, what use was their to explore purely electronic drum playing? The FR-1’s success would set in motion what would turn Ace Electronics into something else altogether. In 1971 Kakehashi cut ties from his own company, and by April 1972, had started Roland to regain the control and inspiration to create musical products he had started to lose. Unable to compete with brands like Yamaha and Kawai in making established musical instruments, Kakehashi decided once again to refocus on one that was never given its due: the rhythm machine. In 1972, with only $100,000 to his name and a staff numbering in the single digits, he swiftly and quickly introduced three rhythm machines; the TR-77, TR-55, and TR-33. It was those drum machines that kept company afloat and let it gain enough traction to create some wonderful products we treasure today. Disparate, varied products like the Roland EP-10 electric piano, the RE-201 Space Echo, the Roland Jazz Chorus guitar amp, the Roland GS500/GR500 guitar and System-100 modular synthesizers were some of these. However, as great as those were, they were great variations on a theme. So, focused on these other industries somehow Roland lost sight of one track that got them there to begin with. It’s the one that would make Roland truly unique, courtesy of a few unsung heroes, ones that would have a far greater impact on our own musical future. 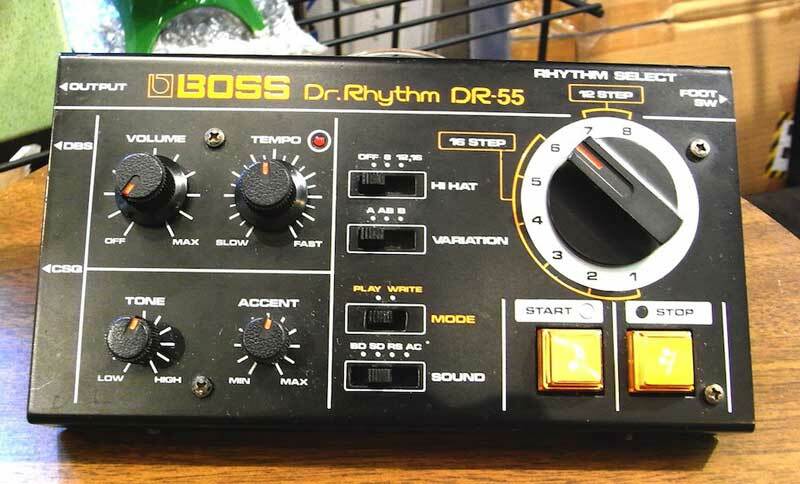 Taking bits of history from the Roland TR-66 Rhythm Arranger (released in 1973), the Roland CR-78 CompuRhythm (released in 1978) and the Boss DR-55 Dr. 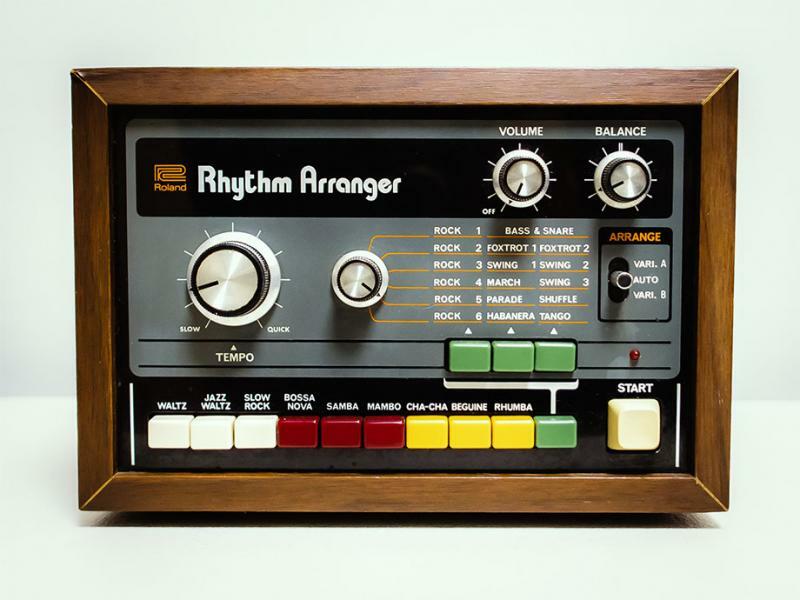 Rhythm (released in 1980), now we have something that can launch a revolution, one that harkens back to Kakehashi’s original Rhythm Ace R1 creation. It’s what would change the drum machine from a mere accompaniment device into something else. TR-66: From the TR-66 we gain the ability to go beyond simple preset pattern variations. The TR-66 introduced the idea of combination. Rhythm Arranger users could press two or more patterns, and add three different pattern variations, to get a combination of hundreds of new drum rhythms. Completely analog in sound, it started to reimagine the idea of this machine having simply preset destinations and gave it room to improvise. 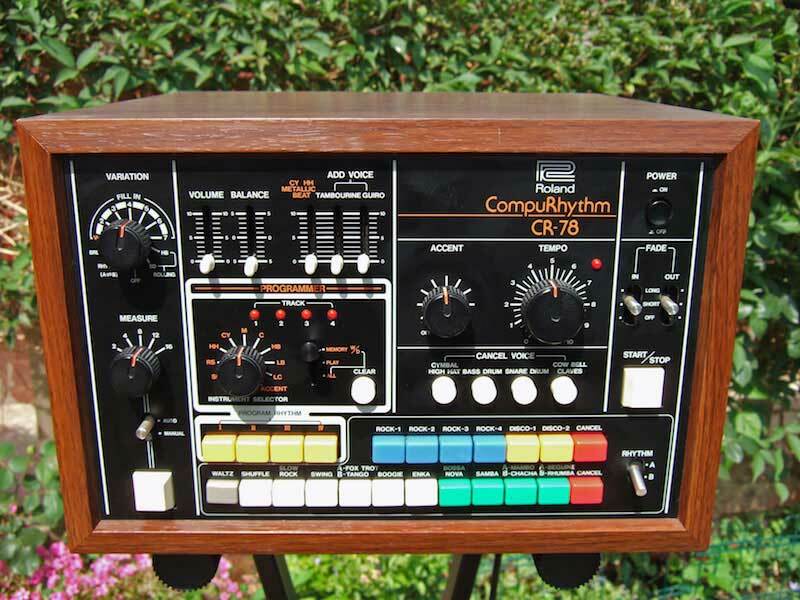 CR-78: The CR-78, the first rhythm machine to use a microchip, added another strain of thought: the idea of creating your own patterns. You could enter and store your own two-bar beats step-by-step on either a a WS-1 button switch or onboard buttons, to create and store up to four rhythm patterns in total. DR-55: From the Dr. Rhythm DR-55, we gain access to a zen koan: “less is more.” Extremely compact/portable and incredibly basic, taking it at face value does not justify its worth. Digging deep, you realize why it solidified this perfect bridge towards our modern drum machines: the DR-55 thought of itself as its own instrument. Dispensing with any preset patterns altogether, providing the most basic of programming controls (tempo control, pattern length, and basic drum tone control) while focusing on just four sounds (hi-hat, snare, kick drum, and rim shot) made it seem like Roland aimed to provide a simple practice tool for musicians. However, its focus on simplicity gave it a unique edge hardly any other sequencer had. Simply set a switch to WRITE, pick a sound, hit START where you want a drum sound to appear in 16 (or 12 of the steps) and hit STOP when you want it it to skip a place. Switch back to PLAY and voila — you’d hear your first drum beat. 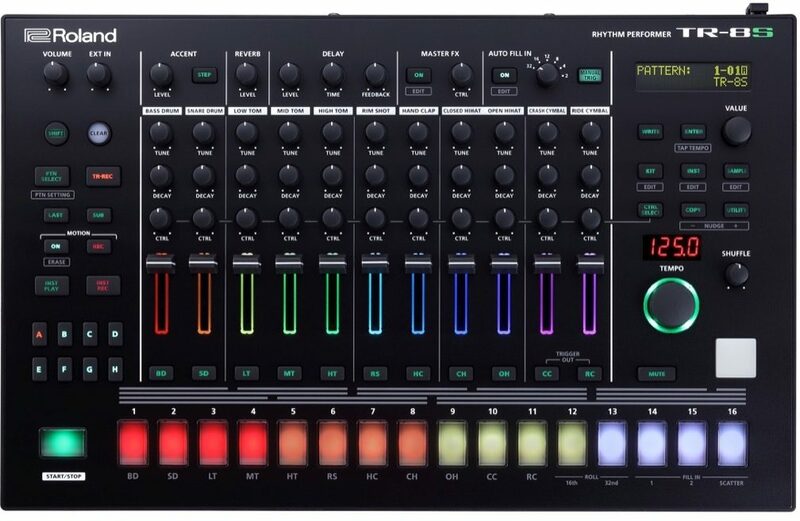 Roland’s TR-8S AIRA Rhythm Performer, the modern incarnation of the TR-808. All of these philosophies came together for the masses later on in 1980 when Japanese electronic drum band Yellow Magic Orchestra debuted the Roland TR-808 on-stage, and in the studio, with “1000 Knives.” It’s hard to quantify how much freedom the TR-808 presented. Freed from preset patterns, and with much more control over the contour and shape of the drum sounds themselves, it placed the focus or responsibility of all drum rhythms on the musician. Trusting that a musician could create their own electronic rhythms far different than the standard Cha-Cha, Beguine, Foxtrot, etc., it signaled a sea change in musical thinking. Once before you didn’t have to be a pianist or organist to be a keyboardist, now you didn’t have to be a drummer to drum. When Ikutaro Kakehashi created his first drum machine way back when, he had germinated this idea. If it took 16 years to fully realize what he was thinking about then, Roland understood now. It’s this instrument, now truly joining the stable of a new class of musical ones, like the sequencer, sampler, and computer, that would pick up the mantle for electronic dance music and it’s where you can start envisioning its imprint on a changing culture.